Be the first to share your favorite memory, photo or story of Lucretia. This memorial page is dedicated for family, friends and future generations to celebrate the life of their loved one. 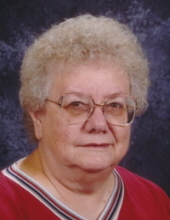 ANDERSON, IN- Lucretia S. Lawler, 77, passed away on Saturday, April 13, 2019 at Community Hospital in Anderson following an extended illness. She was born on July 4, 1941 in Richland Township to Charles and Elna Mae (Castor) Lawler and lived in Madison County all of her lifetime. She graduated from Highland High school in 1959, received her Bachelor of Arts degree in 1963 from Ball State University in Muncie. She later received her Master’s degree from Ball State as well and had a lifetime teaching license. Lucretia taught at Valley Grove Elementary for years before moving to College Corner School. She completed her teaching career and retired from Eastside Elementary School in Anderson. She was a member of the Madison County Retired Teachers Association and the Indiana Retired Teachers Association where she received a Volunteer of the Year award in 2008. Lucretia has been a member of the Madison County Historical Society since 1970 and served as President. In 2018, she received the Elwood H. Phillips Award for her contributions to the cause of preserving the heritage of Madison County. She was a member of two bowling leagues, played and coached softball and at one time was a Reserve Deputy for the Madison County Sheriff’s Department. She was also a volunteer at the Anderson Public Library, specializing in the genealogy department. Lucretia was active in the Madison County 4-H programs. She was also active in the Democrat Party and worked the election polls for many years. Services honoring Lucretia’s life and legacy will take place at 7 pm on Thursday, April 18, 2019 in the Owens Funeral Home, 412 North Harrison Street, Alexandria with Jay Harvey officiating. Cremation will follow the services with interment in Nelson Cemetery in Richland Township at the convenience of the family. Friends may call at the Owens Funeral Home after 4 pm prior to the services. Memorial contributions are suggested to the Madison County Historical society through the funeral home. Owens Funeral Home is honored to care for Lucretia and again serve the Lawler family. To send flowers or a remembrance gift to the family of Lucretia S. Lawler, please visit our Tribute Store. "Email Address" would like to share the life celebration of Lucretia S. Lawler. Click on the "link" to go to share a favorite memory or leave a condolence message for the family.